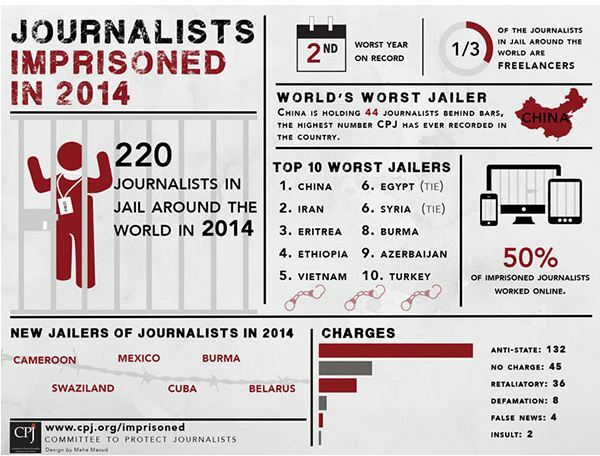 (TibetanReview.net, Dec 20, 2014) – China has the dubious distinction of being the world’s largest jailer of journalists in 2014, according to the latest annual survey of the New York-based Committee to Protect Journalists (CPJ) which published its report Dec 17. The same was the conclusion by the Paris-based Reporters Without Borders (RSF) which published its annual Press Freedom Index on Dec 16. The CPJ report said China had 44 journalists currently in jail, with half of them being either ethnic Uyghur or Tibetan; Uyghurs accounted for 17 of them. The number of jailed Tibetan journalists is four this year, down from nine in 2013, including after the release of amateur filmmaker Dhondup Wangchen who completed his jail sentence this year, the report said. The RSF report, on the other hand, said China had 29 journalists behind bars, besides holding 73 netizens out of a global total of 178. In the RSF report, China fell two places to rank 175th in the world, just fifth from bottom.